This week I attended my first “Town Hall” at work, a department-wide meeting of the kind that has chairs, a podium, a screen and a complimentary breakfast (yum! ), as well as a dial-in number for those who couldn’t make it in person or were in another country. I’m a contractor at my company, and recently I accepted a permanent position at another company. The big goodbye lunch is planned, the little goodbye lunches are being consumed, and there’s a lot of good-natured jibing for leaving along with congratulations and well-wishes. I’ve been with these people for awhile and have some excellent friends (one of whom I walk with over lunch, another of whom is teaching me Go, among other things), and I’ll miss seeing them every day. Now, after we all came back up from the meeting, someone who had skipped the meeting asked why I’d gone, because I was not only a contractor, I wasn’t even going to be around for much longer. And I couldn’t help but think, isn’t that what it’s all about? Good sportsmanship, sportspeopleship, whatever you want to call it—so I’m leaving soon for another company; so what? Does this mean the work I still have doesn’t matter? Should I sluff off company meetings and doodle my way through team fire drills just because I’m moving on? Because I’m “just” a contractor, should I act like my term is over before it really is? I say a big fat no. There’s still a job to do while I’m at the company that gave me that job. Even as a contractor, I have the same goals, the same meetings, the same purpose as the permanent employees. And even with a new job on the horizon, this means being mentally as well as physically present. It means being the valuable resource I was when I was first hired. 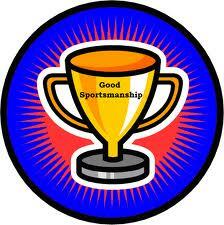 What’s your definition of “good sportsmanship” when it comes to your job, volunteer service or organization you support? When do you feel you’re going too far above and beyond the written description—or is there no such thing? ← Your Career: What’s luck got to do with it?